“The grass is always greener!” How often have we heard this cliché, or even uttered these words ourselves. But shall not the God Who scheduled every day of our life before birth do right? Shall not the One Who knows the number of our hairs do righteously? Shall not the God of all the earth do right by us? Does His hand not lead us into the dungeon’s doom as well as the mountain-tops? Too often we look at the lives of others and see the great work done in them and we fret that in our own little, limited environment we seem ineffective. Our own little contribution is of little worth with little impact and little recognition. And yet as a child of God, it is He Who places us where He wills. If only we would submit to His calling in our lives. If we would only but accept His placement of us, in the world. It is He Who plants us in the earth – to live and to work to His good purpose. Would that we accept this simple truth, that here and now I am where He chose to place me. For to be in the place of His choosing, makes for quiet contentment of heart. To be in the will of the Father makes for inner peace in the soul. Paul - bondservant of Christ, denied every comfort and wrote these words in his dungeon.. I have learned, in whatsoever state I am, therewith to be content. And yet the restrictions of his environment did not prevent him from being used mightily, by the God to whom he submitted his life. Let me not seek to emulate others. Let me be content in all circumstances. Let Him use me where He wills, to His praise and His glory. A story is told of a king who went into his garden one morning, and found everything withering and dying. He asked the oak that stood near the gate what the trouble was. He found it was sick of life and determined to die – because it wasn’t tall and beautiful like the pine. The pine was all out of heart because it couldn’t bear grapes, like the vine. The vine was going to throw its life away because it couldn’t stand erect and have as fine fruit as the peach tree. The geranium was fretting because it wasn’t tall and fragrant like the lilac; and so on through all the garden. 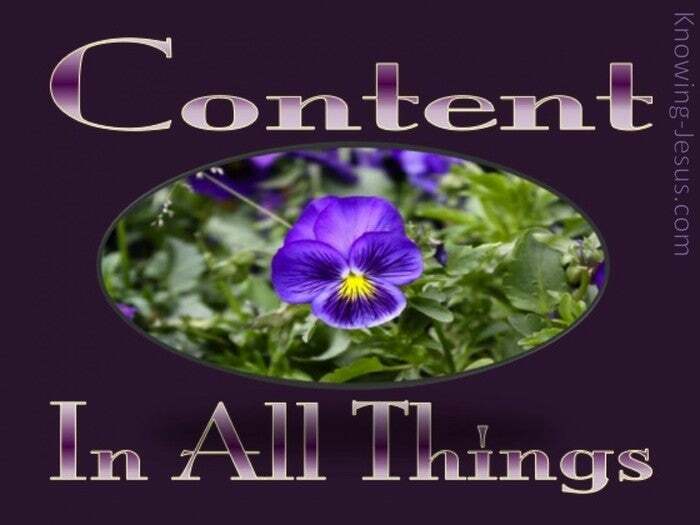 I have learned, in whatsoever state I am, therewith to be content – be thou faithful.